So this morning i'm up at the crack of dawn, I love how early you wake up on the first full day but 3am is just abit too early. We had an 8.00am reservation at be our guest. 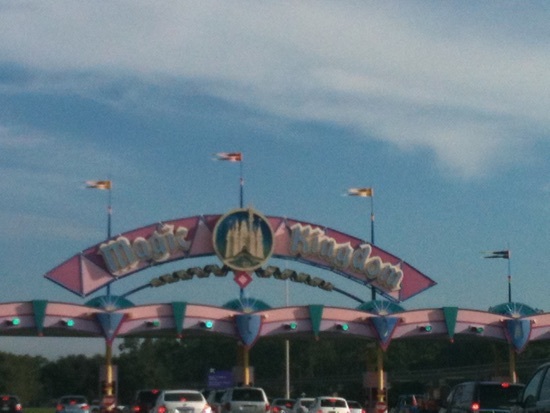 We got let into the park at 7.45 and headed up to the beasts castle. 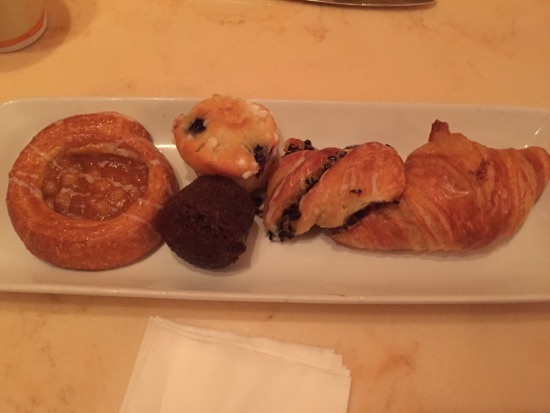 We were given a play of 5 pastries to share. The pain au chocolate was delicious but DH ate the rest so I can't comment but he really enjoyed them. 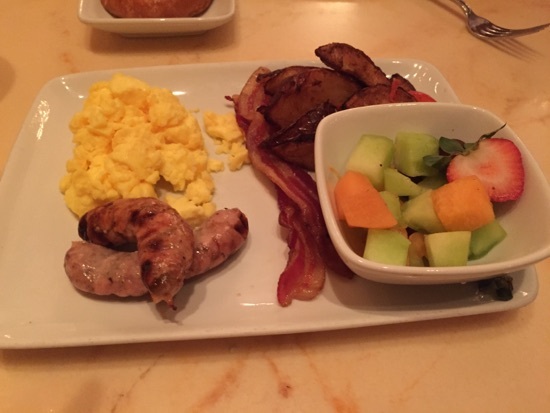 DH ordered the feast a la beast breakfast, he said it was pretty good especially the sausage. However he did have total food envy of mine and DDs. 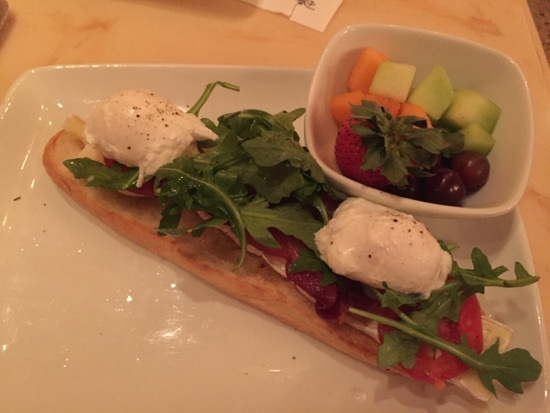 I ordered the open faced bacon and egg sandwich, this was bacon, 2 poached eggs, Brie and rocket on half a baguette. It was absolutely amazing! So tasty. I normally take the wax off Brie and fat off bacon but I ate everything. The fruit was fresh too, there was a mix of melon, grapes and a strawberry.not sure if it would be worth the price but for a QS dining credit it was amazing value. I got a Fanta to drink and DH got a coffee. We'd finished breakfast by 8.35 and were out into fantasyland, we rode the carousel twice, dumbo three times, the barnstormer five times, tomorrow land speedway and then went to meet raise, Minnie, Donald and goofy before heading off for our Mickey Mouse character meet fastpass. 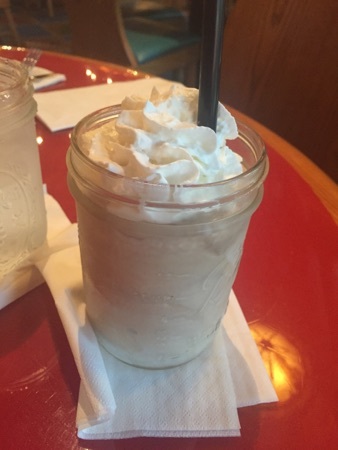 After this we headed to the plaza ice cream shop for some sundaes to share. 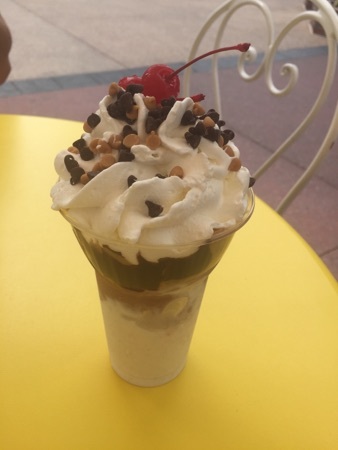 We got the all American sundae which was vanilla ice cream, chocolate ice cream, peanut butter drizzle, fudge sauce, topped with cream, chocolate chips, peanut butter chips and cherries. This was so good but abit sickly if you tried to finish it all . This should have been around $5.69 but we used a snack credit. 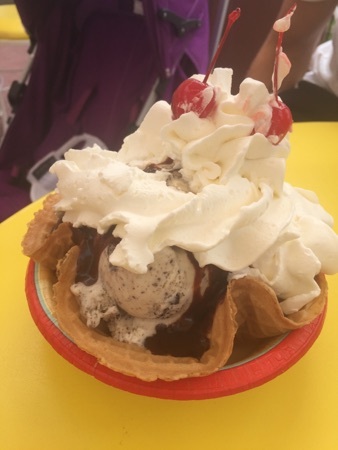 We also got a plaza sundae which was a waffle bowl with a choice of two scoops of ice cream, we went for cookies and cream and chocolate, this was drizzled with fudge sauce and topped with cream and cherries. This was also really good, you can't beat a massive ice cream on a hot day. This too should have been around $5.69. 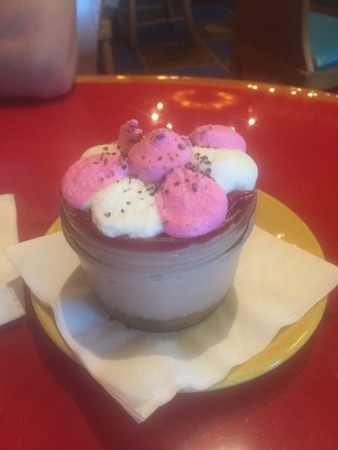 We ended up skipping lunch as we were just too full after these on top of our be our guest breakfast. We left Magic kingdom early afternoon and went back to Coronado springs for abit of pool time before our dinner reservation at whispering canyon cafe. We arrived and checked in at 4.45 and were the 2nd table seated after it opened at 5. Our server was fantastic, he explained the menu and dining plan and left us for a couple of minutes to decide on drinks. DH and I bother got the refillable chocolate milkshake ($7.50) and DD had a chocolate milk ($3.69). The milkshake was proper milkshake made with ice cream and really thick, it was lovely. We were also brought a glass of tap water to go with it. Our server then brought out some cornbread and salad, these were both delicious. 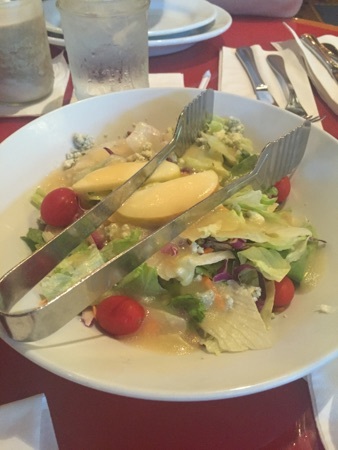 The salad had a tangy dressing and blue cheese crumbles on top and the cornbread came with a salty fluffy butter. We finished both of these off between the 3 of us. For mains DH and I got the skillet ($30.00), it had pulled pork, ribs, chicken, brisket, sausage, baked beans, corn on the cob, mashed potatoes and garlic vegetables. This was amazing, we pretty much finished the lot! 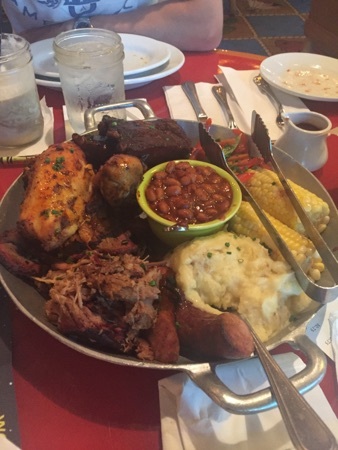 The highlight for me were the ribs and the sausage. 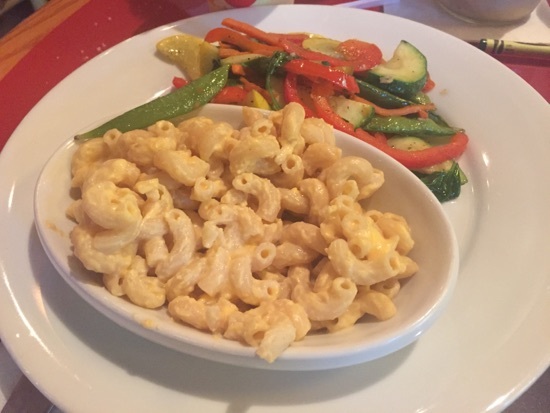 DD had the macaroni cheese which came with the same vegetables our skillet did. She ate alot of the Mac cheese but wasn't too keen on the veg. 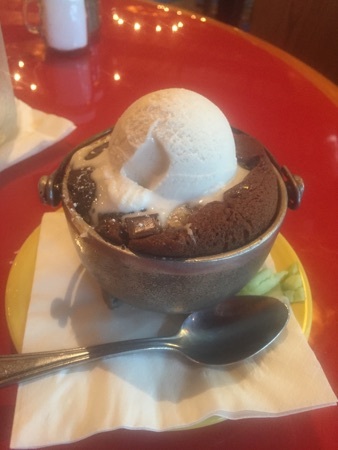 For desert I chose the chocolate lava cake ($9.00), I think this is called campfire ooey gooey chocolate cake on the menu, it came with ice cream and tastes amazing, unfortunately I only managed about half due to filling up on the skillet. DH got the cheesecake ($8.00), I think this was strawberry, he couldn't mange much of it either, but enjoyed what he did eat of it. DD has apple slices ($3.00) which were just as it says, slices of Apple. She managed to eat all of these. 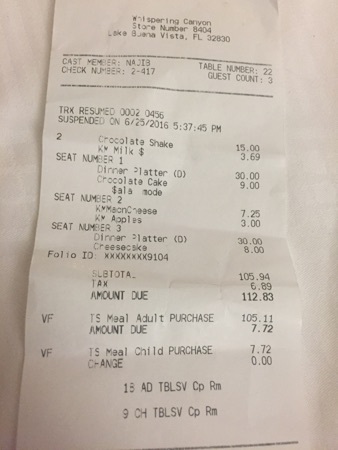 Our bill came to $105.11 and we used 3 dining credits. Our server was absolutely brilliant and his service was very prompt without it feeling rushed. There was a lot of ketchup to-ing and fro-ing across the place and just before we left they had a hobby horse race around the room which DD loved. Overall we thought whispering canyon cafe was excellent, we are here 5 years ago and thought it was ok but tonight it was wonderful. The food, atmosphere and service. We headed to Epcot briefly after dinner and decided to have an earlyish night. Having just checked my Fitbit I've done 32893 steps today or 13.84 miles, no wonder were shattered! Looking forward to seeing all of your wonderful eats. Wow, a very early rise & shine on your 1st day! Sounds like you packed lots of rides in too! Love those ice cream sundaes!